This rugged step is made from maintenance free polyethylene and is made to fit any above-ground pool without a deck up to 54in. In depth. Double handrails and big slip-resistant steps make an easy exit for young and elderly swimmers alike. The steps mounting pads will help protect your liner and keep it from tearing or becoming damaged by the steps. 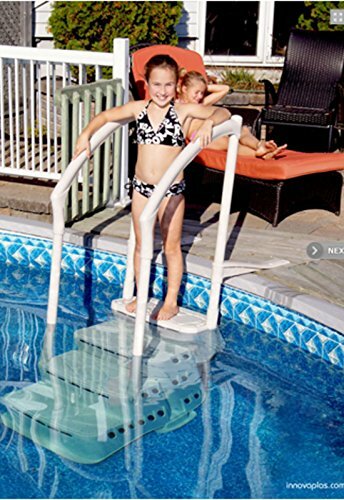 The BiltMor above ground pool step is designed to meet all NSPI standards. The ladder flips up and secures with a pad lock to form an entry barrier for added security. It provides easy access for children with every step at 11 inch and a 21 inch wide passage over the pool. This unit is easy to assemble and holds up to 350 lbs. The step offers you great water circulation to prevent algae formation. Ladder must be used in conjunction with step only backed by a 1-year manufacturer warranty. Ladder dimensions: height: 44in. From ground to top step width: 19in. Depth: 24in. Step dimensions: height: 42in. Width: 25in. Depth: 46in. This ladder should not be used with index/inflatable/pop-up style pools. This unit is easy to assemble and holds up to 350 lbs.